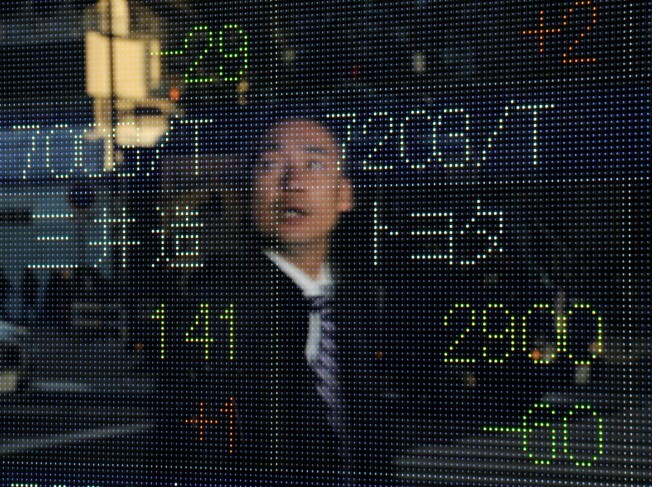 A man checks stock prices on a Tokyo brokerage's indicator showing the Toyota share drops 60 points to 2900 on Japan's benchmark Nikkei 225 stock average Friday. HONG KONG – Asian stocks were mixed Friday after Japan slashed interest rates to almost zero as central banks around the world seek to pump cheap money into the markets to support a troubled global economy. The Bank of Japan lowered its key rate from 0.3 percent to 0.1 percent after a near-unanimous vote by its policy board announced in the afternoon. Pressure to cut Japan's main interest rate — known as the uncollateralized overnight call rate target — had intensified after the U.S. Federal Reserve sliced it own benchmark rate to a range of zero to 0.25 percent — the lowest level on record. Analysts said the Fed's action left Japan, its exporters reeling and economy already in recession, with little choice but to follow suit. Japan's central bank echoed that bearish view Friday, citing the harsh impact of tumbling exports, weakening domestic demand and job losses. "Under these circumstances economic conditions have been deteriorating and are likely to increase in severity for the immediate future," the bank said in a statement. An initial surge in Japanese stocks on the news soon petered out, and Tokyo's 225 stock average dropped 78.71 points, or 0.9 percent, to 8,588.52. The dollar, higher in the morning, weakened against the yen after the bank's announcement. "A strong yen continued to weigh down on the market, dragging down exporters," said Yutaka Miura, a senior strategist at Shinko Securities Co. Ltd. in Tokyo. Also following the Fed was the Philippine central bank, which cut its key interest rate by half a percentage point Friday. Recent moves by central bankers around the world to loosen monetary policy — aimed at reviving credit markets so companies spend again — would ultimately help equity prices, said David Cassidy, chief equities strategist at UBS in Sydney,"
"They're a necessary step on the road to recovery," he said. Hong Kong's Hang Seng Index was trading 1.9 percent lower at 15,203.66 even as Beijing said Friday it would help the territory keep its economy stable amid the global financial crisis. Markets in mainland China, South Korea, Australia and Singapore traded higher but none posted gains of more than 1 percent. Energy shares saw heavy selling after oil continued its downward spiral overnight, with the January contract falling as low as $35.98 — levels last seen in June 2004. Prices recovered some in Asian trade, with light, sweet crude for February delivery up 73 cents to $42.40. In the U.S. Thursday, markets lost ground amid more downbeat economic news and worries about the rating outlook of industrial powerhouse General Electric Co. The Dow fell 219.35, or 2.5 percent, to 8,604.99 and the Standard & Poor's 500 index fell 19.14, or 2.1 percent, to 885.28. Futures suggested Wall Street would open lower on Friday with Dow futures down 49 points, or 0.6 percent, at 8,688 and S&P500 futures off 6.2 points, or 0.7 percent, at 886.300. In currencies, the dollar fell to 89.01 yen, down from 89.51. The euro traded at 1.4259.